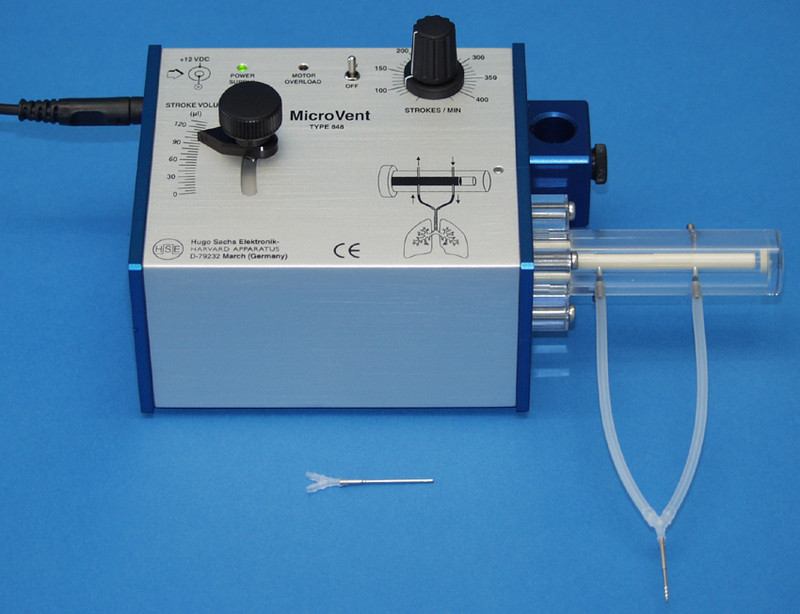 The newly developed MicroVent Model 848 Ventilator is a quiet, compact and light weight ultralow volume ventilator. The MicroVent is the ideal ventilator for very small animals (e.g. birds and perinatal mice) which requires tidal volumes in the range of 0 to 130 μl and respiratory rates of 60 to 400 breaths per minute. ventilation cycle, the plunger performs a synchronized forward and rotating movement. Cleverly arranged bores and channels in the cylinder and plunger control inspiration and expiration during each stroke of the plunger. The extremely light weight and compact construction, in addition to the convenient rod clamp, allow the MicroVent ventilator to be positioned directly next to the animal. 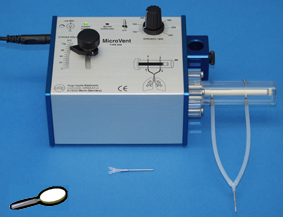 Typical setups with larger ventilators produce large tubing and instrument dead space volumes. These larger volumes introduce greater system compliance which can affect the accuracy with which the full tidal volume is introduced into the animal’s lungs. With the MicroVent, the tidal volume error due to system compliance is reduced to less than 3 μl. Tidal volume and respiration rate can be set exactly to the values required for animal ventilation. The level of precision and control available to the investigator minimizes the danger of hyperventilation or hypoventilation. The tidal volume can be varied continuously from 0 to 130 μl during operation without having to interrupt ventilation. The respiration rate is also continuously adjustable from 60 to 400 strokes/min. The expired air can be recovered at the collection port for sampling, recycling or for the generation of a positive end-expiratory pressure (PEEP). Room air or any non-explosive gas mixture can be used to feed the pump intake. A multi-gas inlet adapter is available for the MicroVent so that alternate gas mixtures and nebulized substances are delivered to the MicroVent inlet port at atmospheric pressure. The adapter provides ports for multiple selectable gas mixtures (hypoxic, anesthetic...) and a port for the Aerosol Nebulizer. The Battery pack for the MiniVent or MicroVent respirator is used to run these Ventilators independent from a power supply. This is important when the surgery and the experiment have to be performed in different rooms and the animal must be moved under ventilation using the MiniVent or MicroVent. The Battery pack is connected to the Ventilator instead of the power supply. For charging the Battery pack it is disconnected from the ventilator and connected to the suitable charger. The Battery pack is a 8 cell NiMH (Nickel - Metal hydride) battery, which has with 2300 mAh (a large capacity). It can run the MiniVent or MicroVent for approximately 40 hours.